Regardless of what the outcome of the Arsalan Chaudhry case is going to be, audiences in Pakistan are having a field day watching the case’s repercussions play out across different camps in the commentariat as some of Pakistan’s most famous TV talking heads slug it out in an increasingly ugly – and open – mudfest. It started with senior Dawn News anchor Talat Hussein accusing Geo pundit Najam Sethi (just a shade shy of taking his name) of being in the employ of real estate tycoon Malik Riaz and, therefore, being morally compromised when it came to commenting on the issue. Mr Sethi expressed his intention to start legal proceedings against Talat Hussein and said that he had already served a legal notice to Dunya News anchor and former Lollywood producer Mubasher Lucman and had managed to get a restraining order against him from the high court. Mr. Lucman, the enfant terrible of Pakistani TV journalism and not particularly famous for being a meticulous fact-checker, had claimed Mr Sethi had US nationality and that his daughter worked for the late US Af-Pak envoy, Richard Holbrooke. Both claims were untrue. Pakistan’s lively mainstream news media has had many professional rivalries amongst its ranks but they were, by and large, kept under wraps. With time, the awkwardly maintained veneer of professional courtesy is coming off. let me add fuel to fire! Much of these anchors are BIG TIME A _ _ HOLES! They are as corrupt as the political, bureaucratic & military lot is! Dr. Shahid Masood, one way or another, works for Al-Jazeera even if that does not appear to happen! Najam Sethi is on the payroll of some shadowy funded US think tanks! He usually remains in Virginia half a year and runs a news paper that mocks the urdu press in a "Brown-sahib" "looking-down-upon" way! Javed Chaudhary usually remains on foreign trips (God knows who funds them perhaps Malik Riza??? ), Sana Bucha is hell bent to find any fault in IK come what may to save he beloved N-League uncle ………. the most interesting story is of Hamdi Mire who was offered a big cheque by Dunya News CEO Mian Amir yet when Mir Shakeel threatned Hamid for his life (plus increased his perks), Mir sahib took a u-turn and remained "committed" to GEO!! And all those gossips about Nadia Khan, well they are too much talk of the town how she ruined 5 crore rupees and her married life on a charming hunk in Dubai and is now a "no one" !! Care to add something!! Feel free to do so gentlemen! You forgot to mention the most corrupted of all ranks….judiciary in Pakistan. The coco and bull sold out by iftikhar ch that he has no idea what the business of his son is /was. His five Mrs iftikhar and the rest of the family was living five star life and globetrotting. Secondly those 40 carore ended up at CJ's residence and and not anywhere else. If he has any shame he should resign and make a bench of three senior most judges and not the judges closest to him. Yes his position is no more tenable, he must go! According to the statement of Aloneinalonelyplanet no one is an honest journalist or anchor persons. There are certain substandard anchors the glaring example is Mubashar Lucman of Dunya and Kamran Khan of Geo but more or less these anchor persons are doing job reasonably well in the newfound freedom given to the electronic media. The problem with Mr Sethi is that he has a 'Chirya' which brings him the information and then he disseminates it to the public. The problem with the journalists and anchor persons is that they do not have courage to take criticism and take course of legal notices. Talat Hussain was blamed for being an agent of Stratfor and therefore the CIA etc etc but he did explain all the points one by one and I think Mr Sethi should also have done the same. There are confusing signals emanating from this episode which has produced reverberation both nationally and internationally. The information which was given to the public in the first instance was that Malik Riaz has met some journalists but now he is denying. It was also told that some of the top anchorpersons met Ms Christina Lamb but she has denied that as well as you would have seen on the Twitter. I think it would be better just to watch and wait or wait and see what transpires from the current episode. Not only these anchors are big time a–holes, their holes are also very big time! Najam Sethi is well read man and not an ignorant anchor..He is brave and was tortured by Nawaz and Saif ur Rehman. .I have highest regards for him. Of all the political analysts, Najam Sehiti is the most talented person. He is very well read and presents his analysis without fear or favor. In fact our hyper nationalism and ghairat brigade has done more harm to Pakistan than any other factor. Most of our anchors and commentators suffer from this disease, as such they cannot think rationally. 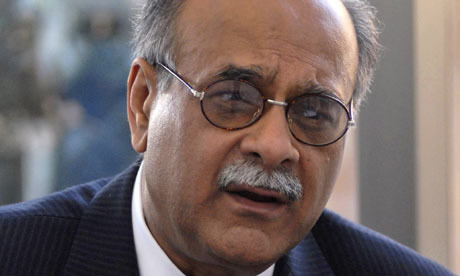 Najam Sethi of New Delhi failed state fame….please forgive … don’t you have anything better to do than wasting time on the agents of foreign powers. najem shatei sab is one most senior analyst of our country. i am really liable to his contribution and work, he is one most credential journalist of the Pakistan. he is professional in his field. once more i am extremely thanks full to him for his tragic support for the K.K Aziz to write one of a wonderful book," the murder of the History "
ISLAMABAD: For those dreaming to excel in the banking sector, the story of Kausar Malik inspires confidence: a man who first manoeuvred his induction as Senior Executive Vice President (SEVP) in the National Bank of Pakistan (NBP), his house was also hired, a banking unit was shifted at the premises and he was then posted at his home. How the public sector banks are being looted day in and day out by crooks would have remained a secret had it not been disclosed in a report of the State Bank of Pakistan (SBP) after an inspection carried out in the NBP. As Kausar was posted in the National Accountability Bureau (NAB), he changed four banks in five years, but never visited any officer even for a single day. The latest position he managed to grab was as SEVP in NBP that was apparently allotted to him for using his good offices for recovering the defaulted amount, a task which remained unfulfilled. Kausar nevertheless remains in the NBP. He was terminated only to be reinstated shortly. As for putting his house on rent to NBP, a confidential SBP inspection report of 2010 states: “The management acquired one of the premises on rent in Rawalpindi from bank’s SEVP (Kausar Malik) in violation of PR G-2. It may be mentioned here that HRM&AG had shifted an investigation unit of Institutional Discipline Wing from Regional Office Islamabad to that premises and the same SEVP (owner of the premises) was posted at his own premises without having any assignment”. Nevertheless, the bank allowed continuation in his service even after termination of contract with NAB, the SBP report explains. A letter in possession of ‘The News’ shows he was terminated from NBP, the day he was relieved from NAB, but the order was reversed as Kausar managed to apply pressure on the management. Kausar, who simultaneously served in banks and NAB, has an unmatched career not only in NAB but also in banking sector. As he served in NAB at positions like deputy chairman, director general (Operations) and director general (Financial Crime Investigation Wing), he was also employed first in Prime Bank as assistance vice president, then in Faysal Bank and finally joined the NBP. He made a lot of fortune in the meanwhile. However, he had denied most of the allegations during his interview with Ahmad Noorani. Kausar also own enormously big properties across the country allegedly made during his career at NAB, but in his version to The News he denied owning some of these properties and say about the rest that he has made them with his savings he had made during his long banking career. Any private banker could be appointed in NAB for tenure of five years and a banker from public sector could be attached with NAB for a period of three years according to the rules of NAB. Kausar had joined NAB as member of FCIW (on rank equivalent to deputy director, grade-18) on attachment basis on personal recommendation of Brig Nasir, chief of staff to the then chairman NAB, who belongs to Chakwal. Within one and an half year Kausar was given the regular cadre in NAB and was made DG-FCIW, a post equivalent to grade-21, this time with the blessing of Maj Gen Siddique also from Chakwal. By using the NAB platform and especially FCIW and cases of wilful default, Kausar became VP in Prime Bank, according to NAB sources. However, Kausar insisted that he already was VP in Prime Bank when joined NAB in 2004. However, record reveals that Kausar by use of same means switched his job and became SVP in Faysal Bank. There were numerous cases of bank default of billion of rupees pending in FCIW. The NAB record shows that there were huge corruption cases of top officials of a public owned bank pending with FCIW of NAB. Five years tenure of attachment of Kausar with NAB was coming to an end and according to top NAB sources by using these cases of huge corruption Kausar got himself inducted in this state owned bank on a position not less then SEVP. Kausar however said that his appointment in this public owned bank was fair and he was inducted through a top head hunter firm after proper interview and fulfilment of all formalities. Kausar though didn’t tell his salary in an interview with Ahmad Noorani, but said that his salary was justified and even some junior bankers were getting salaries from Rs7 to Rs10 lac per month. Beside this salary, perks and privileges bestowed on Kausar by this state owned bank are countless. Mr Sethi was my favourite journalists but now he speaks a different lingo and that undermines Pakistan and augments the US ‘s view point. Bad deeds don't always go unpunished!